Back in July when I did the Old Gaol progress update from the grandstand view of the County Hall roof, Colin Wiggins sent me this picture of the same view from back in 1968 – before the swimming pool was built. 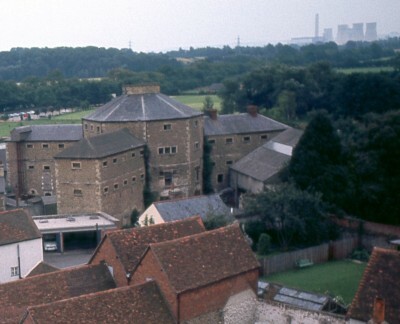 It shows out buildings and a car port as part of the Old Gaol complex. Having lost that grandstand view I shall have to rely more on other reports and snooping about. 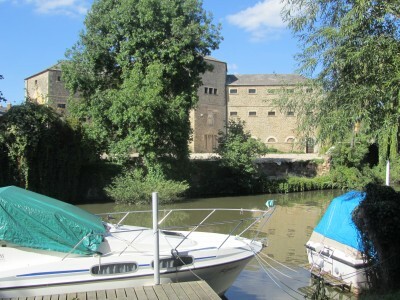 The Old Gaol has hit the headlines on two occasions in the last month. 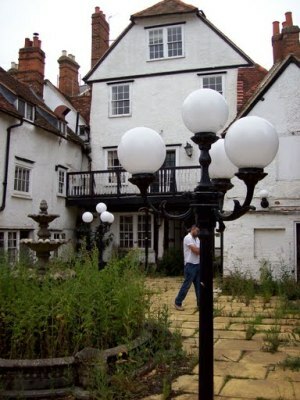 First because the developers cut down a tree of heaven after the demolition works had damaged it, and second because ownership has transferred to Cranbourne Homes and building work has commenced. The VWHDC press release said “Initially, the work will concentrate on site infrastructure and constructing a new 60 space underground car park, before moving on to building the new flats and restaurants. 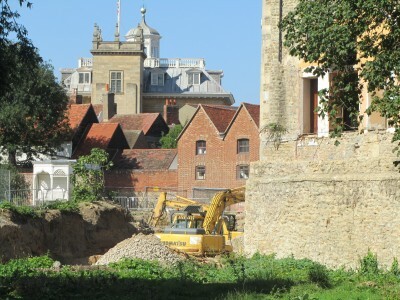 Following completion of the demolition and archaeological work … ownership of the Old Gaol site has been passed from the Vale of White Horse District Council to developers Cranbourne Homes. There was another story didn’t make any headlines I saw. One archaelogical firm had the job and did the dig. The more local Abingdon group thought there was still more to be found in the way of Roman remains and wanted more digging done. 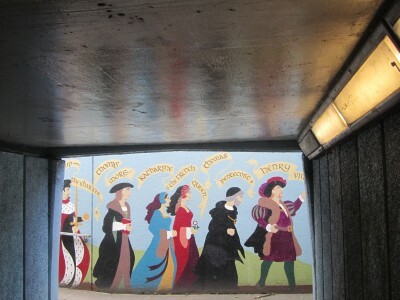 The mural in the underpass – showing people from the past – was repainted a couple of years ago and covered with an anti graffiti covering. That does not stop graffiti but it does make grafitti a little easier to remove. 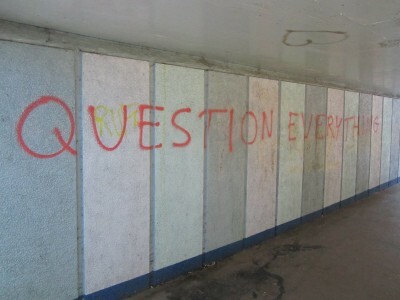 A google search shows that this particular graffiti statement “Question Everything” predates most of the rest of the mural. 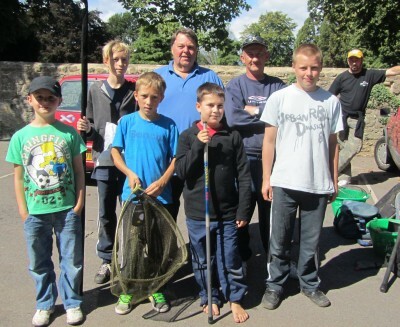 On Saturday was the Mayor’s Junior fishing contest. Bank Holiday Monday saw the senior event with over 30 contestents. It began at 10 am and ended at 3 pm. The boating season does restrict the number of good pitches. 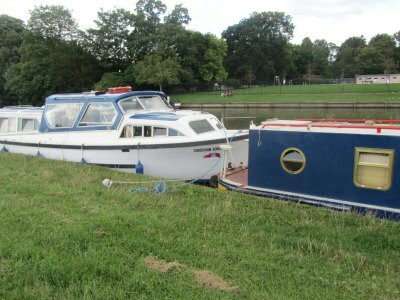 Abingdon does have free moorings. Upstream from the bridge there are no fixed moorings and boat owners hammer in their own spikes and get very close together. In places they double park. The best catches during the day were down near the marina where some of the fishermen caught over 18 lbs. This chap near the bridge got about 13 lbs – the best in his stretch of the river. 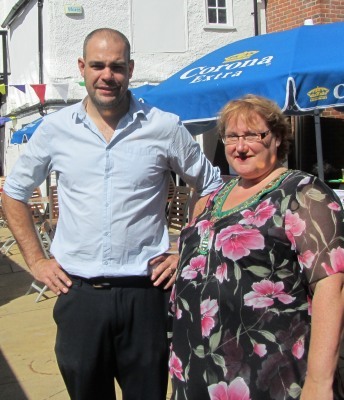 The landlord of the Kings Head and Bell is seen here one year later with the Chairman of the Vale at the opening of the first Annual Beer Festival. Lots of different local beers were on offer. 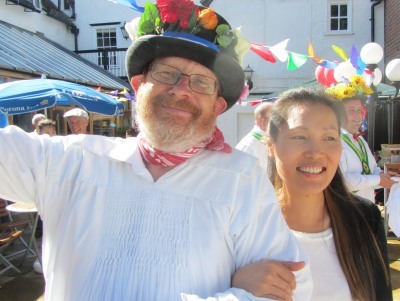 Steve Green on his blog (Abingdon Beer) will have far more detail. 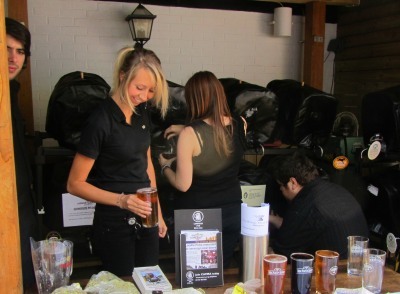 He was working his way through the twenty or so beers on offer last time I saw – showing great dedication to his blog. 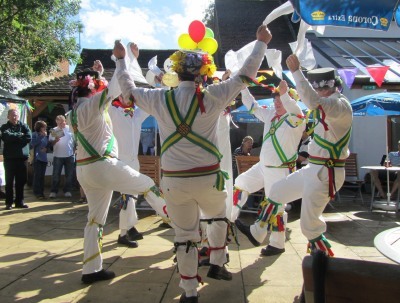 This afternoon the morris men were performing at the festival. Weather has been good, apart from a sudden downpour at 2:30pm – the time they were meant to start. So they started late and carried on most of the afternoon. It gave their bagman the chance to get aquainted with quite a few young ladies. He picks them out of the crowd to be danced round. You can see him here breaming from ear to ear!!! 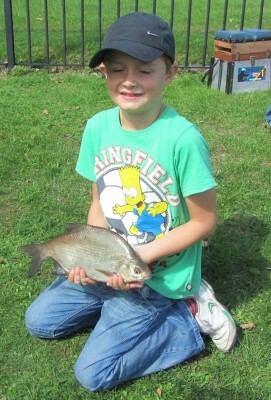 The winner Rhys Griffin, aged 7, caught the Bream. 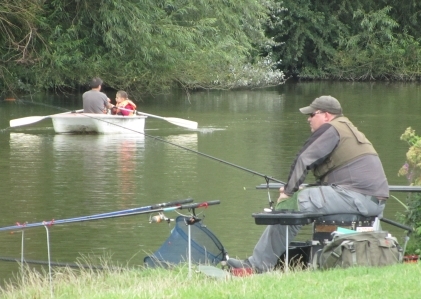 The competition is organised by Abingdon’s water bailiff, Mick Foster, with the blue cap. Next to him is the legendary Fat Phil, who owns the fishing tackle shop on the Abingdon Road in Oxford- who donated some of the prizes. Phil is not quite so fat any more.